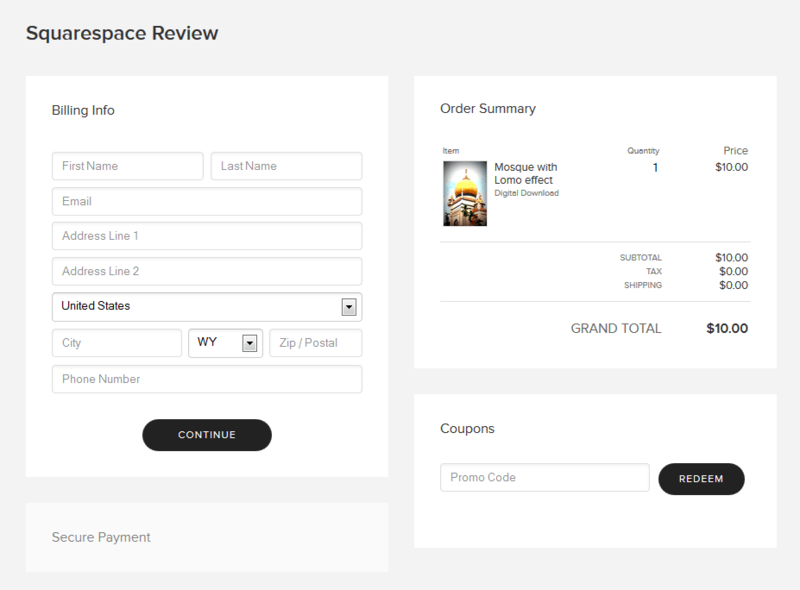 Squarespace Ecommerce Review: A Great Way to Sell? It took Squarespace almost 10 years to launch an ecommerce feature. But is it any good? There are a few things we like instantly: ecommerce is available in all plans and it allows you to sell physical and digital products as well as services, which is very interesting. For example: if you are a consultant selling consultations by the hour – with a classic online store, you can’t do this very elegantly. Sell online without transaction fees. Comes with advanced ecommerce features (e.g. automatic discounts). Monthly prices based on 1-year contracts; Domain name included. You can add your shop in four steps. The available features are well explained. Only the sample items they display in your store can lead to confusion as the pages that seem to be there do not actually work. The selection isn’t huge but there are decent options for online stores. All designs are responsive so they will be displayed well on mobile devices. Product page titles and descriptions aren’t customizable. Another flaw is the general site title that will be added to each page title, e.g. Online Store XYZ – General Page Title. Not particularly good for SEO. Add images of your product. Clicking it will open a larger view in a lightbox. You can define a regular price as well as a price when the item is on sale. Adding videos is possible but they will be hidden away in the ‘More Info’ section. Each item can have up to 100 variants (SKUs). Entering them is easy but can be time consuming when done manually. There isn’t an easy or integrated way to add user product reviews. Squarespace generates a SKUs automatically. Accept credit card payments (Visa and Mastercard) through Stripe, their payment processor. The fee is $0.30 + 2.9% per transaction. Squarespace also charges a sales fee in the Personal (3%) and Business plan (2%). In the UK, the fee is 0.20p & 2.4%. Other than that only Paypal is available. The buyer receives a download link via email that will be valid for 24 hours. The max. file size is 300 MB. We liked the fact that there is also a special product type for services such as consulting. Checkout and payment pages are SSL encrypted. The ecommerce plans Online Store Basic and Advanced provide customer accounts. Fixed dollar amount or percentage discounts. Another option is a voucher code for free shipping. The duration can be limited. Flat-rate or based on the weight of the items. Specify the countries you want to ship to. US customers can use USPS’s system to automatically calculate the cost of shipping. Not with big players like AliExpress. Artists can work together with Printful. It’s an on-demand printing service that prints and ships custom designs. You can set up individual VAT rates for all countries worldwide. Taxes will only be displayed on the checkout page and not on the product pages (which is a requirement in some countries). There is no automatic tax calculator for US states available, all states and tax rates have to be added manually. Allow local tax rates (ZIP code based) as well. Stock control: customers will never be able to place any orders you are not able to fulfill. You can set a threshold for automatic email notifications. Notification emails are customizable in HTML. Import products from your existing Etsy, Shopify or Big Cartel store. Exports are not possible, Squarespace lock your products in their system. You can add a tracking code to the checkout page using the code injection feature. Export all your orders as a CSV file for your accounting or invoicing software. There is also a direct integration with Xero (US only). Very decent ecommerce store for smaller operations, good for bloggers and other solopreneurs. A major disadvantage are their SEO flaws. Squarespace’s online store is a solid way to get your merchandise out to the public. We like that they also make it possible to sell digital products as well as services – something particularly suitable to bloggers and freelancers. The only two payment processors they support are Stripe (for credit card payments) and Paypal. It’s worth noting that it took Squarespace almost four years (and numerous complaints) to finally add Paypal. In order to avoid Squarespace’s own sales transaction fees (ranging from 2-3%), you have to sign up for one of their Commerce plans, which are $26 (Basic) or $40 (Advanced) per month. It’s great that they offer more advanced e-commerce plans, which allow you to grow. If, however, you are prepared to spend that kind of money right away you may want to directly sign up with a dedicated e-commerce provider like Shopify or BigCommerce. There you will also have much better SEO features. Countries in which Squarespace Business is available: U.S., U.K., Canada, and Ireland. If you are from a different country, we have a few alternative options for you below. Does Squarespace Commerce support Paypal? Yep, your customers are able to pay via Paypal in your store. Unfortunately, you can’t use Paypal to pay for your Squarespace site. Will my Squarespace online store on mobile devices? Yes, their layouts are responsive. Is the ecommerce module good for SEO? Squarespace’s SEO capabilities come with a couple of big limitations when building an online store: you won’t be able to customize title tags or meta-description tags for your product pages. This will make it more difficult to rank in search engines such as Google or Bing. Additionally, these limitations also apply for blog posts. 28 Sep 2017 - Additional review criteria added. 14 Dec 2016 – Paypal is now available. 07 Apr 2016 – Sales fees updated. 26 Nov 2014 – Tax settings added. 02 Jul 2014 – New review layout, general updates. 31 Jan 2014 – Online store is in every plan available. 04 Dec 2013 – More countries added. 20 Aug 2013 – The online store is now also available in the UK. 30 Mar 2013 – Video review of the online store added. 20 Feb 2013 – Squarespace adds a shopping cart with their Business plan.